Liam competed in his first Tae Kwon Do tournament today. He got a bronze medal in both patterns and sparring! This pattern is called Saju Makgi and is the first pattern a white belt learns. I thought he did really well, but he did get one warning for kicking below the belt. The Open Adoption Roundtable is a series of occasional writing prompts about open adoption. It's designed to showcase of the diversity of thought and experience in the open adoption community. You don't need to be listed at Open Adoption Bloggers to participate or even be in a traditional open adoption. If you're thinking about openness in adoption, you have a place at the table. The prompts are meant to be starting points--please feel free to adapt or expand on them. Write about open adoption agreements. Is there one in your open adoption? What effect does it have on your relationships? If you could go back in time, would you approach the agreement differently? I haven't participated in an OA Rountable since June of last year, when the prompt was about siblings. I don't write about adoption very often any more, but this prompt caught my eye. We have an open adoption agreement with Liam's Mom. I had to get out my scrapbooks to remember exactly what it says. It has one page for prior to placement and finalization. On this we indicated yes to face-to-face meetings and telephone calls and letters at 6 months (the estimated time of finalization) It also indicates gifts to be exchanged at Christmas and July (Liam's birthday), with gifts sent through the adoption agency. The other page refers to post finalization and indicates that we (the adoptive parents) have discussed having an open adoption after finalization. and has our names, address and phone number. We wanted to ensure that she always had access to us. However, we did not sign these papers with Liam's Mom present and I can't say if she got copies of them or not. This agreement is signed in trust, is not legally binding, and in no way affects the legal status of the adoption. Open adoption was (and is!) very important to me. The problem is that you can't force someone into contact or a relationship. So while we have kept communication open - sending letters, pictures, emails - it is all one sided. Liam's Mom does not reciprocate. I guess that makes our agreements null and void. The only one who loses from this is Liam though; the only one who had no say in any of this. Monika from Monika's Musings, a birthmom in an open adoption, recently wrote a great post: To the Uninvolved Birth Parent. She also has another post about the legalities of open adoption agreements, and how they should go both ways. She says everything that I feel, but so much more eloquently then I ever could. Please be sure to check her out, as well as all the other Open Adoption bloggers writing about this round table. What every Mother needs at the end of the day! Blog-checking lines: Our April 2012 Daring Cooks hosts were David & Karen from Twenty-Fingered Cooking. They presented us with a very daring and unique challenge of forming our own recipes by using a set list of ingredients! This month's Daring Kitchen Challenge was unique. Instead of giving us a specific recipe or cooking technique, we were giving 3 list of ingredients. We had to create our own recipe(s) by using one item from each of the lists, much like a mystery box challenge that you see on a lot of cooking shows. And to keep things interesting, the list of ingredients was... unusual, in that you wouldn't often see these things combined. I really had no idea what to make. Hilary doesn't like parsnips or cauliflower and I'm not a huge fan of eggplant, so we weren't off to a good start with just the main ingredients. Hilary has one recipe that she makes that involves cooked bananas, and I love Bananas Foster, but I couldn't think of any other way I would want to include them in a recipe. In the end I came up with three dishes, each using 3 different ingredients from the lists, so that I used them all, including the bananas. Coming up with a recipe from scratch is not my thing, and I got caught up in worrying about the ingredients from the lists so I didn't even think to expand the recipes beyond the 3 items. I think if I had focused more on developing a curry or stir fry that incorporated the ingredients instead of making them the sole focus, I might have enjoyed the end results more. I cut the cauliflower into small florets, coated them in maple syrup and roasted them until they were almost caramelized. Then I tossed them with chunks of goat cheese and served them on a puff pastry nest. Verdict: This dish was tasty, but the goat cheese was a bit overpowering, and I found the whole thing dry. I should have added some sautéed onion and garlic to the cauliflower to give it some more flavour. I peeled and cubed the eggplant and fried it up with the chipotle peppers until it was tender. Then I added chunks of banana, and cooked it until the bananas had softened. Verdict: This was my favourite dish of the three, however the chipotle peppers were a bit too hot and took away from the overall flavour. Surprisingly the banana/eggplant combo was quite good. I love parsnip chips so I thought I would try to make my own. Since I was trying to use all 9 ingredients, I tried a version with coffee, but you couldn't really taste it. The version with maple syrup was very nice. I thinly sliced the parnips, coated them in balsamic vinegar and coffee/maple syrup. I pan fried some and roasted some. The roasted ones were better, crispy and sweeter. Verdict: Not as good as store bought chips, but still quite yummy. All in all I would consider this month's challenge only mildly successful. I'm not likely to make any of these recipes again, but it was fun to be pushed out of my comfort zone to try and create my own recipe. I think I'll be sticking with following recipes for quite awhile. 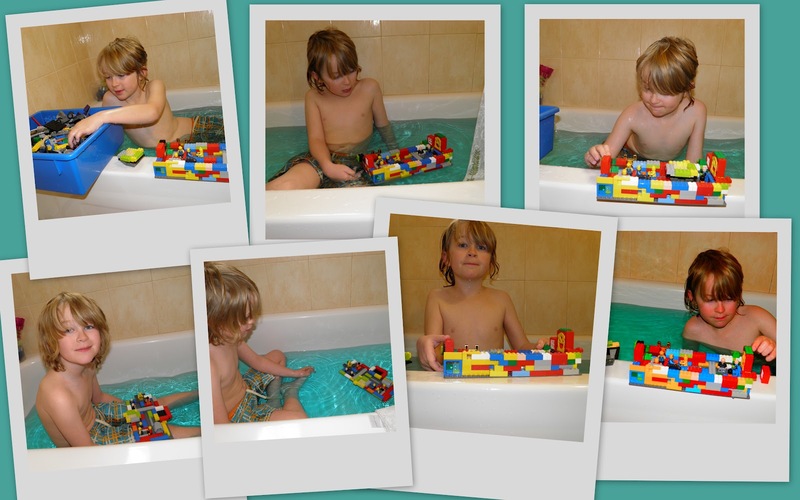 Who knew that Lego in the bathtub was a great way to spend the afternoon? Especially when Mama dyed the water blue for your boats!